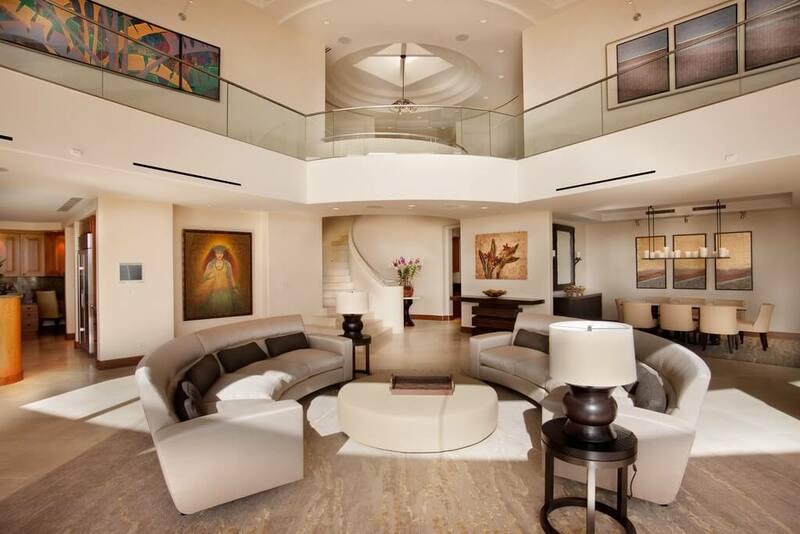 Welcome to today’s gallery, featuring beautiful living rooms sporting an ottoman coffee table. 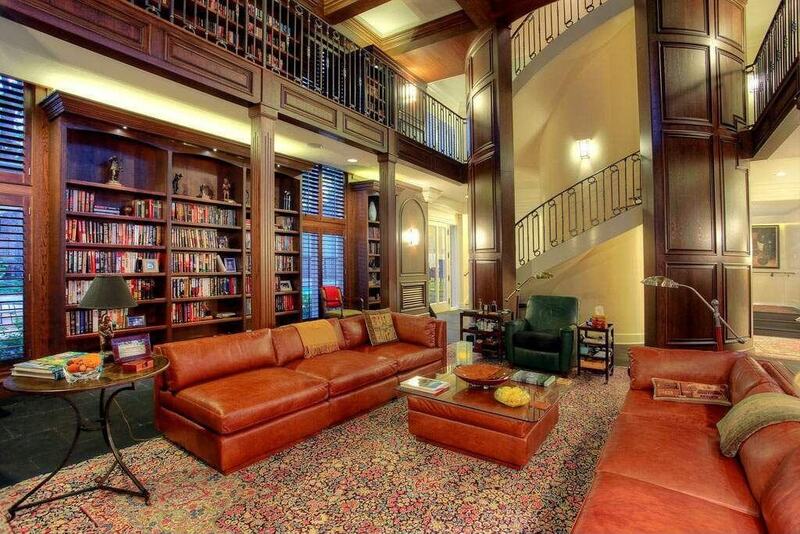 Why specifically ottoman coffee tables, you may ask? 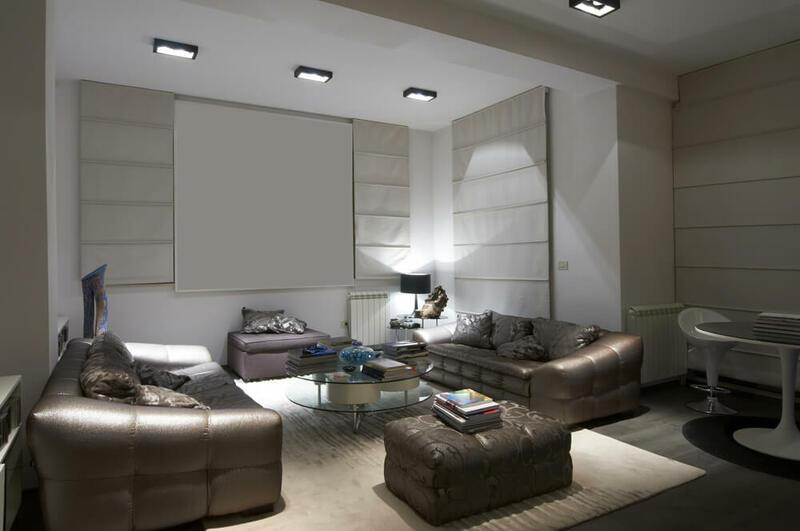 To begin with, these are some of the most versatile pieces of furniture you can have at your disposal. With myriad uses and placements even within a single room, this hybrid furniture can mean the ability to shift the composition of your living room without any heavy lifting. The ottoman coffee table can be used as a standard foot rest or guest seating, naturally. It can also function neatly as a coffee table, using a wooden try or reversible cushion top. The reversible top is one of many styles of surface these units may feature. 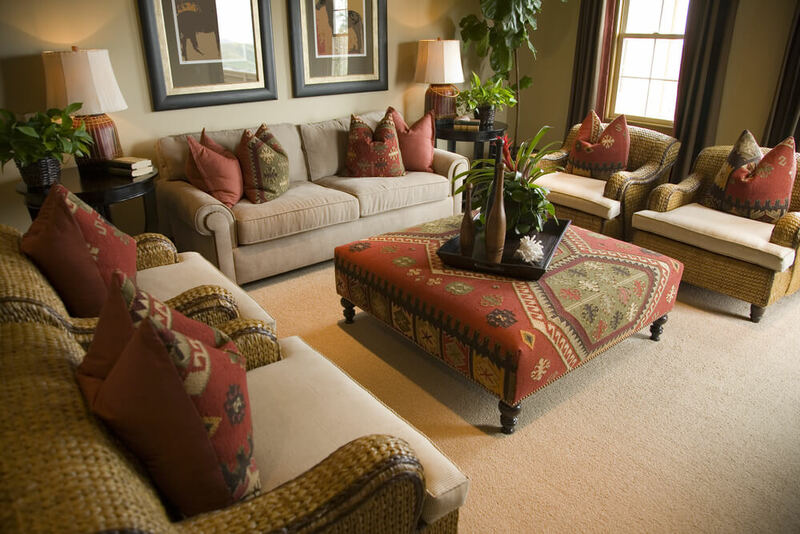 Larger ottomans may hold as many as four individual cushions, flipping to reveal tray table surfaces and hidden storage within. Check out the above living room’s full design review! The extra space can be moved to laps, and the interiors can hold anything from blankets to board games to remote control collections. 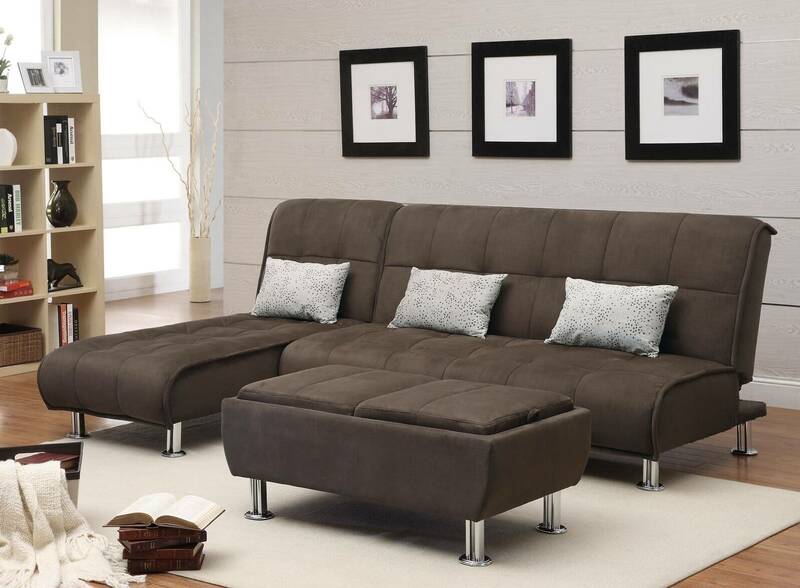 Flippable, hinged, raised, or otherwise, the cushions on many of these models are more than meets the eye. Great at creating an “extension” for existing furniture or simply matching a given theme with a new place to sit or place drinks, the ottoman coffee table is an aesthetically pleasing and utilitarian addition to any living room. 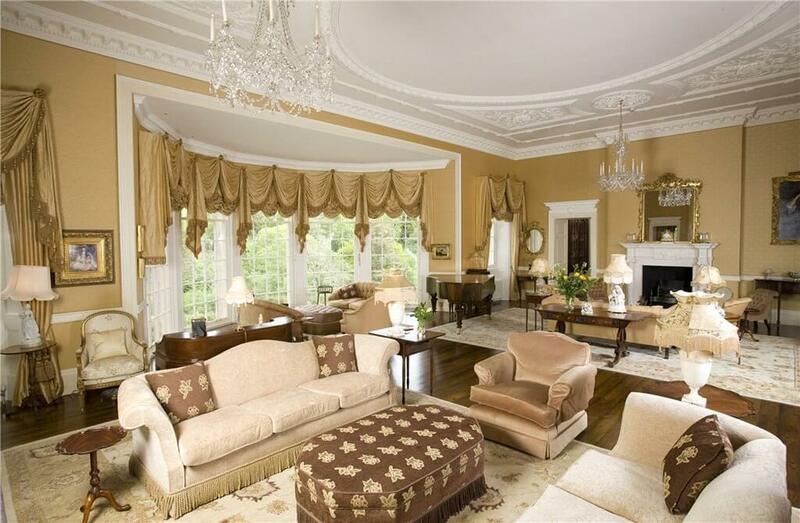 Warm golden hues throughout this natural hardwood floored living room, with pair of matching armchairs and lengthy sofa wrapped around large square brown button tufted ottoman, featuring dark carved wood structure and arrow feet. Take a look at the in depth design review. Light toned living room stands over grey hardwood flooring, with neutral grey sofa next to text-patterned white armchair and matching square cushion ottoman. .
A casual color palette that includes a cream colored couch, blue and brown pillows, and a blue ottoman coffee table. 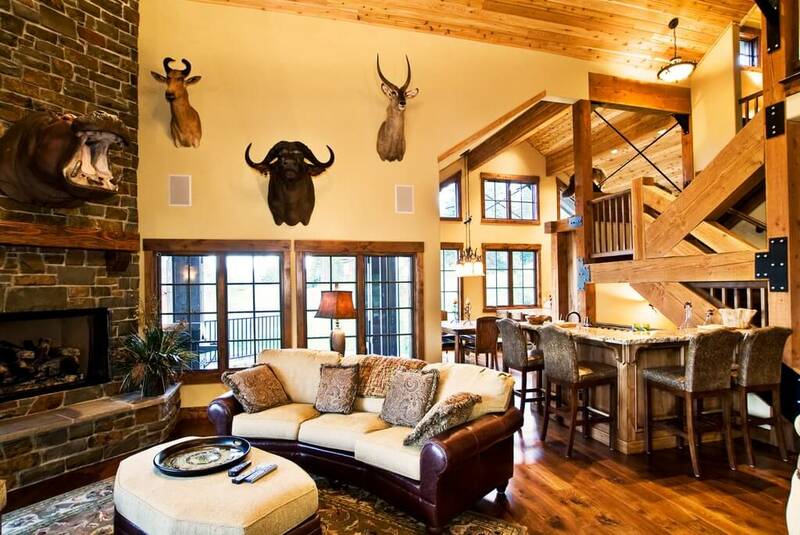 This elegant room includes the table and large comfortable couches for lounging and watching television. 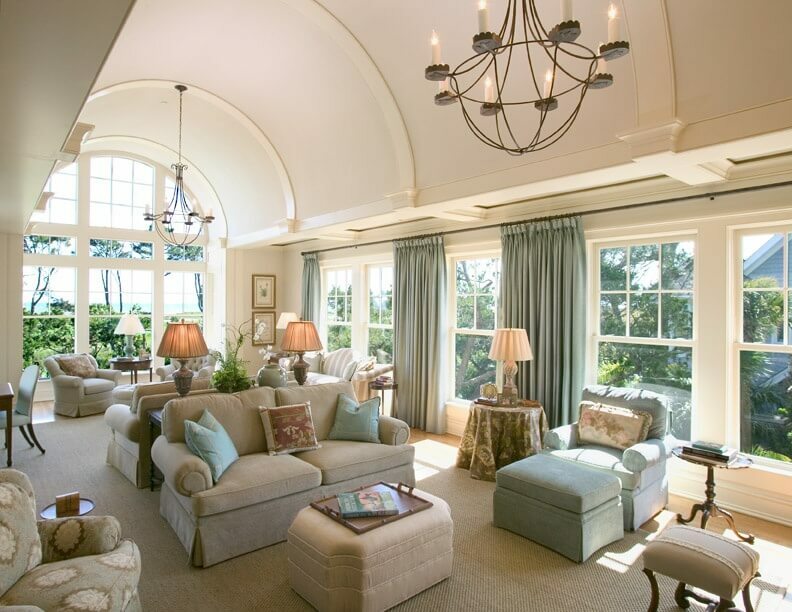 This living room is gorgeous with the dark wood and dark leather couches contrasting the light colored fabric couches. The turquoise accent colors make this whole room pop! 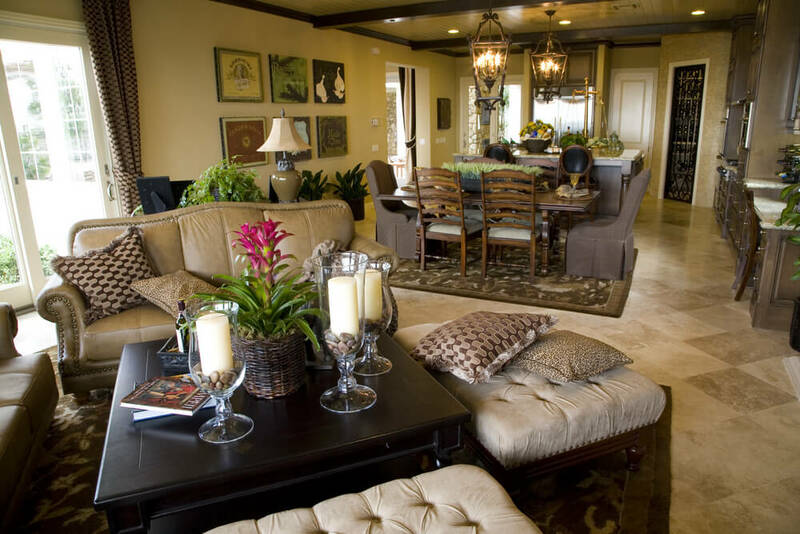 The sectional and ottoman table match perfectly, I would love a room like this! 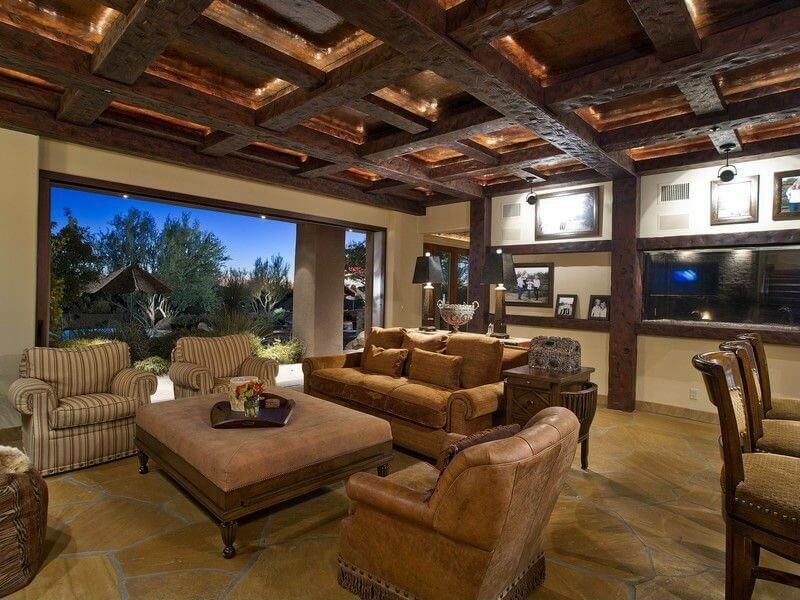 Lush details abound in this open living room, shared with dining and kitchen space. 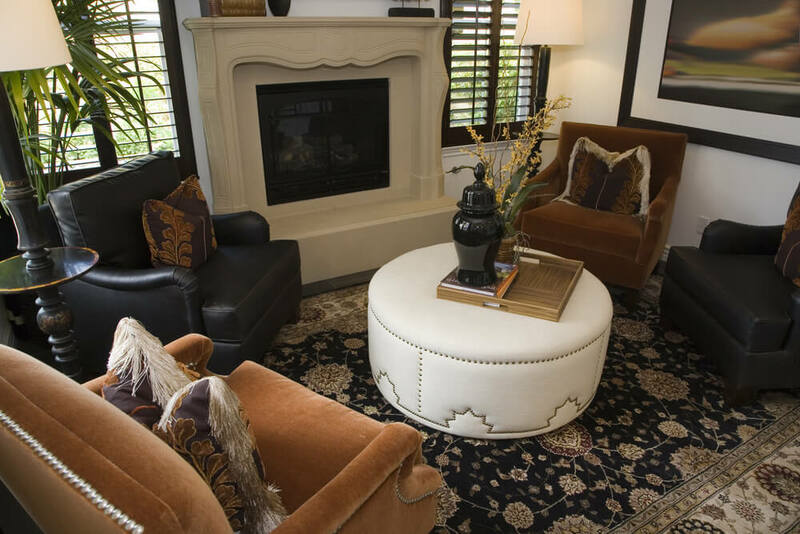 Twin leather sofas are matched by button tufted twin ottomans with hardwood frames, centered around large black wood square coffee table. 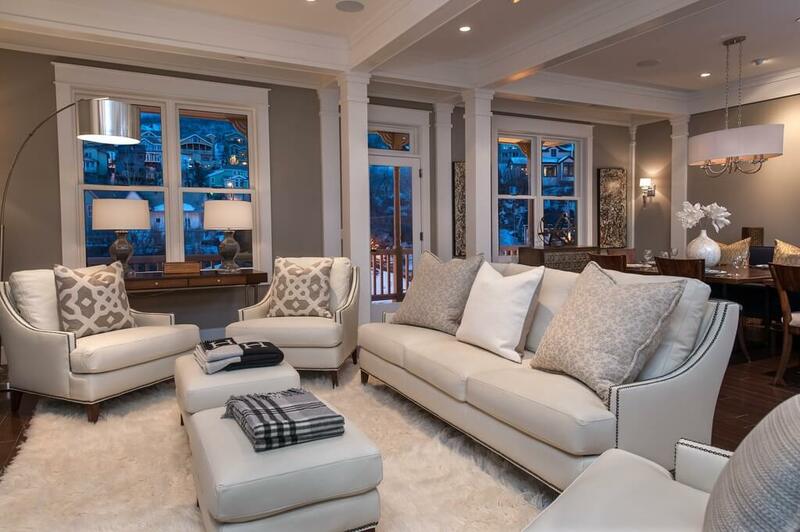 High contrast themed living room features white sofas with black trim, patterned rug over dark hardwood flooring, white fireplace, and large square dark tufted leather ottoman at center. 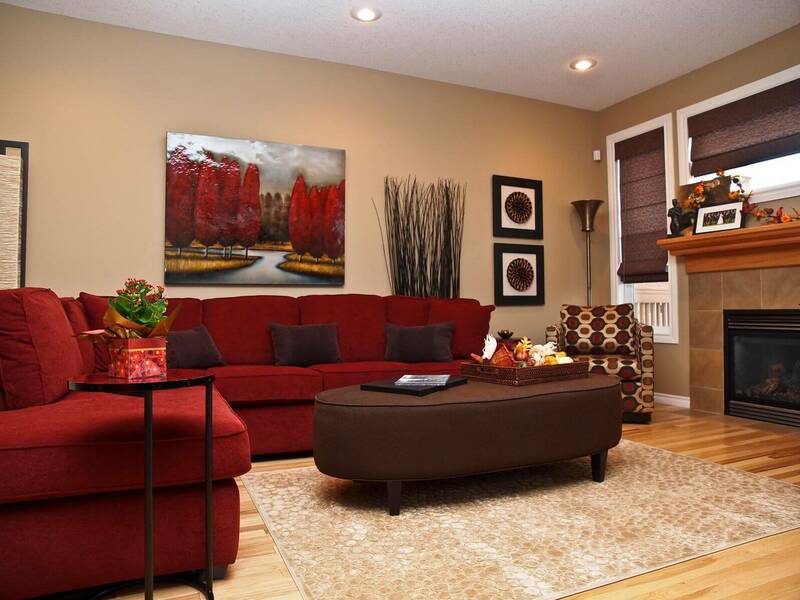 Compact living room with dark mocha chair and armless sofa, contrasting with white single-button tufted twin ottomans. Bright, contrasting color patterns throughout this living room, featuring neutral toned sofa next to teal button tufted fabric ottoman with dark wood arrow feet. . 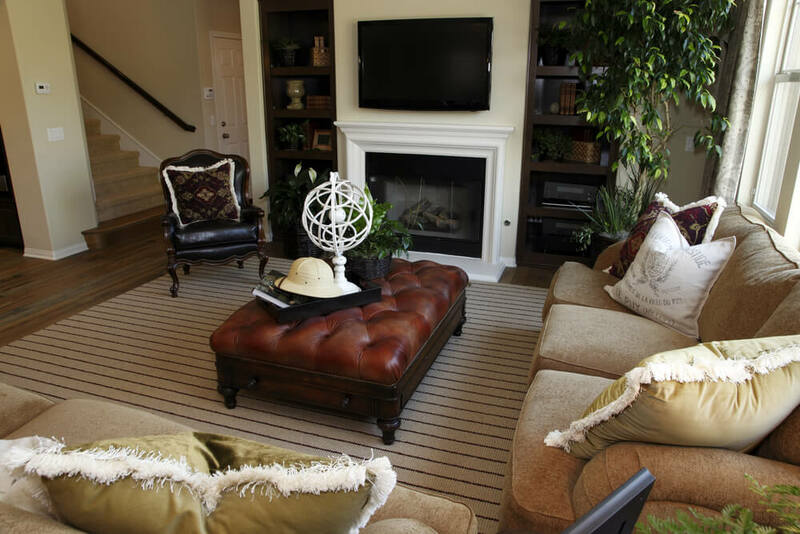 Dark brown rug and light, two-toned furniture set unify this cozy living room. 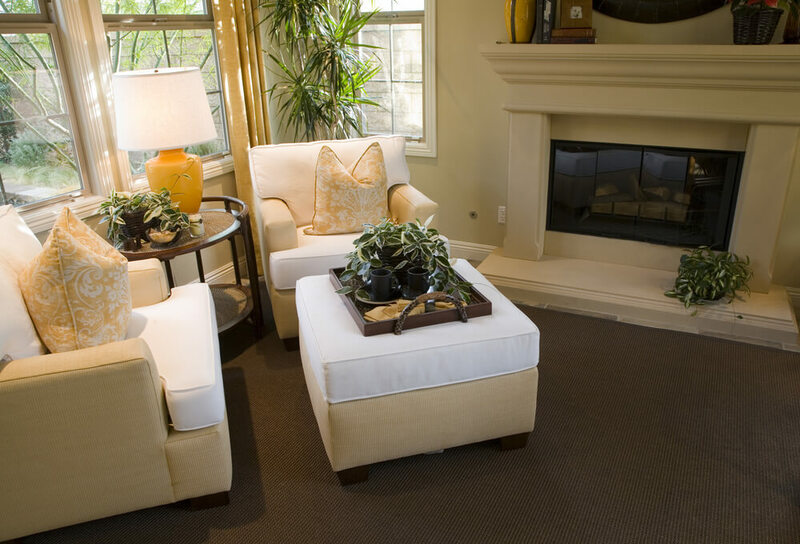 Beige bottoms with white cushions on chairs and matching square ottoman, featuring removable dark wood table surface. 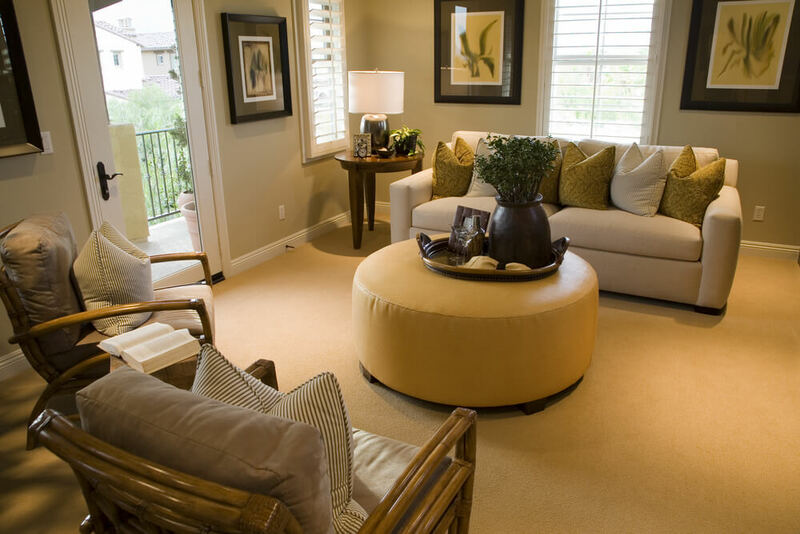 Warm yellow round cushioned ottoman stands at center of this cozy living room, awash in natural earth tones. 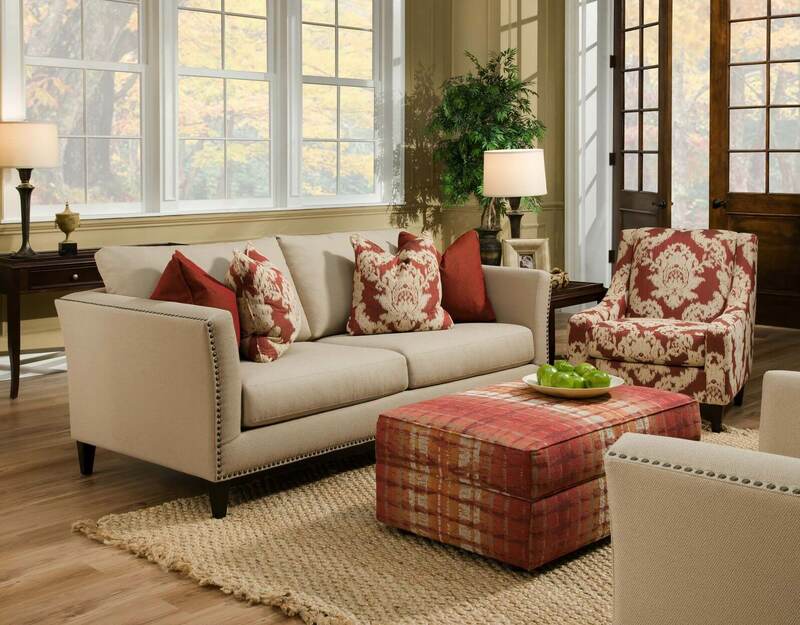 Beige twin couches face each other over natural hardwood flooring and tan rug in this living room featuring red patterned fabric rectangle ottoman. . Traditional living room set up, with striped twin armchairs, ornate accent chair, and blue sofa, is centered around large soft cushion leather ottoman with removable wood tray table. 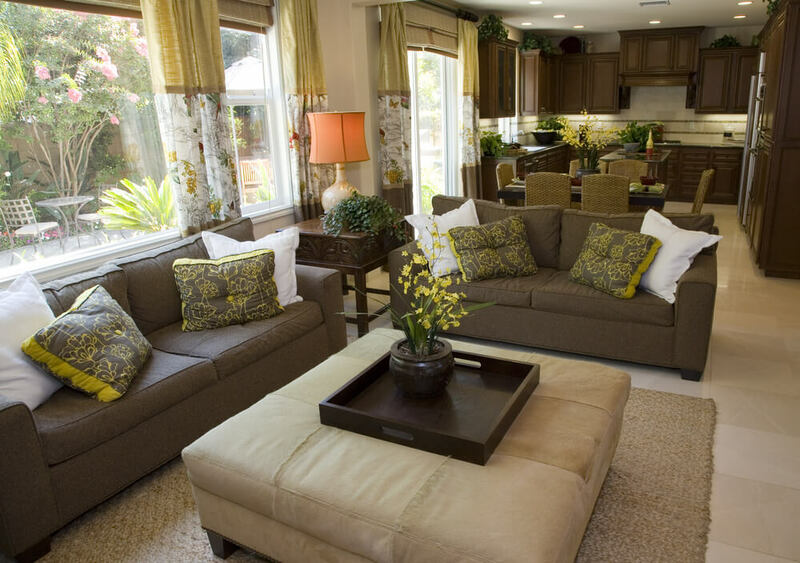 Compact living room space features mocha fabric sofas over dark hardwood flooring with beige rug, plus light leather square ottoman, replete with nail head trim and cushion top with floating dark wood tray table. Tightly matched living room features beige, brown, and purple accents throughout, with smaller purple rectangular ottoman butted against large square beige ottoman with portable tray table surface and house plant on top. 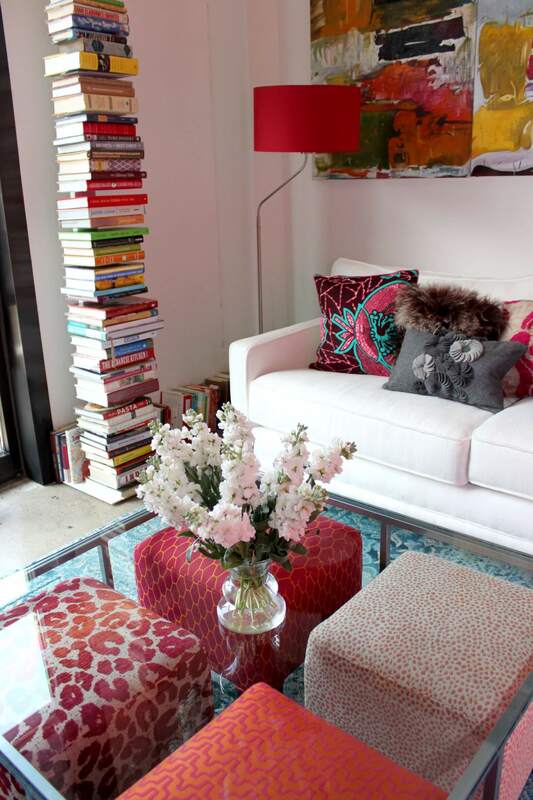 This living room features a metal framed, glass surface coffee table encompassing four cubic, brightly patterned ottomans. . 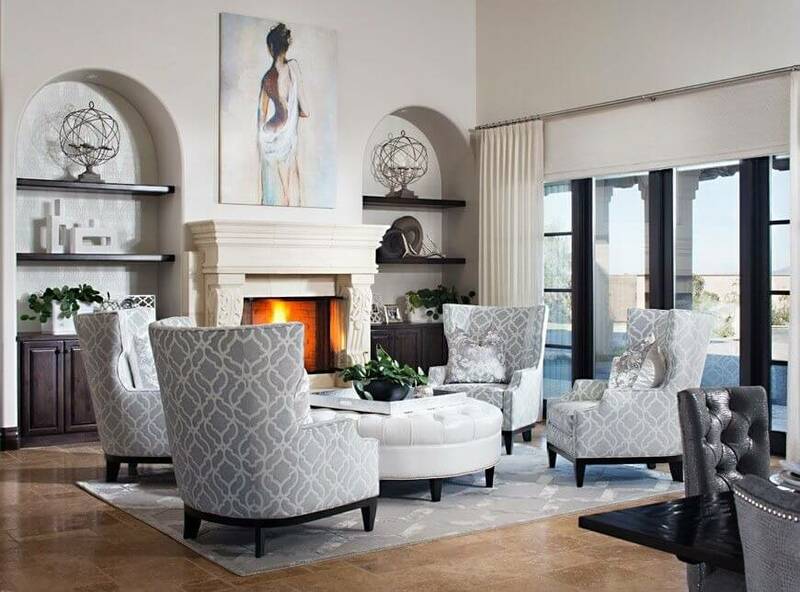 Cozy living room with immense white fireplace and white L-shaped sectional sofa features dark wood framed light fabric ottoman at center, with dark wood tray table on surface. 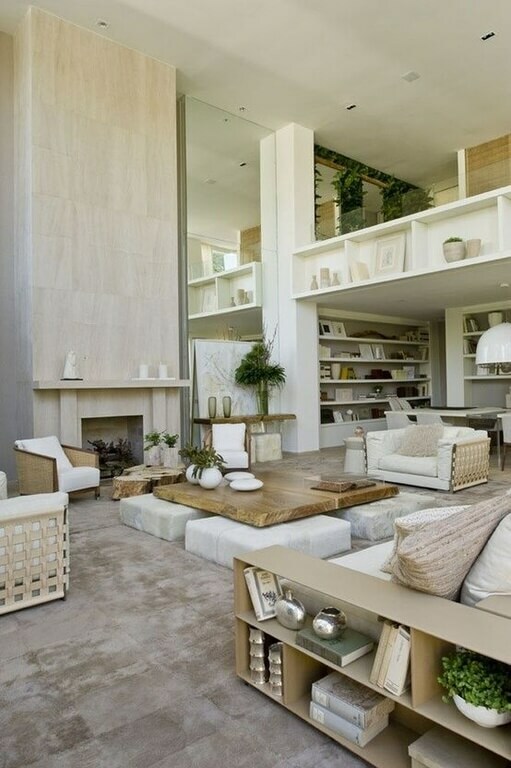 This modern living room, naturally lit via floor to ceiling windows, features immense white leather ottoman over dark wood frame, with twin wood table surfaces on cushion. . 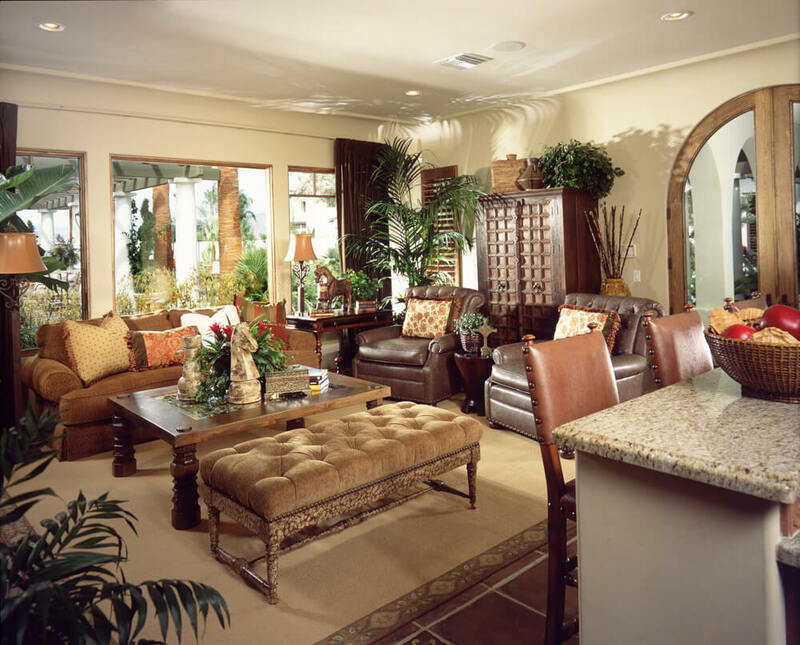 Lengthy open living room space shared with U-shaped kitchen in distance features twin brown sofas facing large square beige leather ottoman with removable dark wood tray table. Cozy living room with commanding stone fireplace features alternating orange and black armchairs orbiting nail head trimmed white leather ottoman with portable wood surface tray. 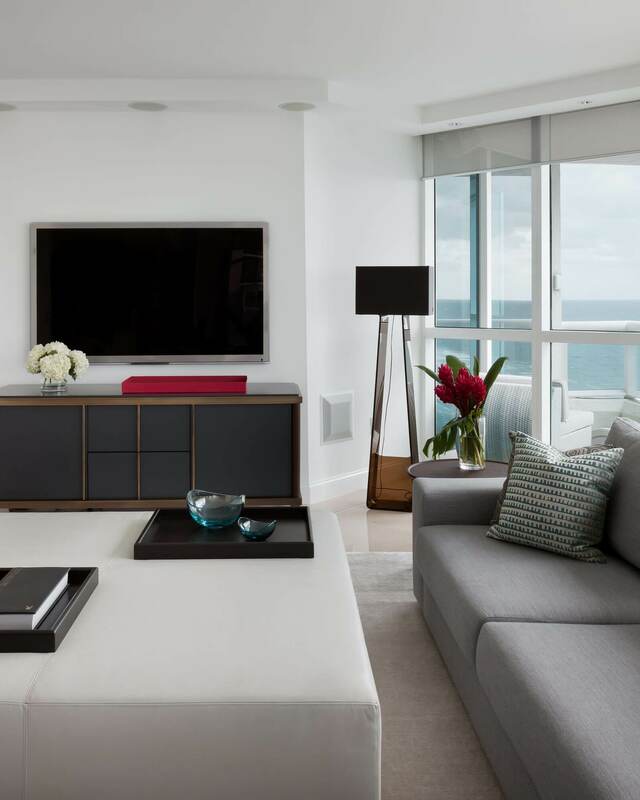 Slick textures in this modern living room include minimalist wood media center and off-white leather square ottoman with twin dark wood removable table surfaces. . 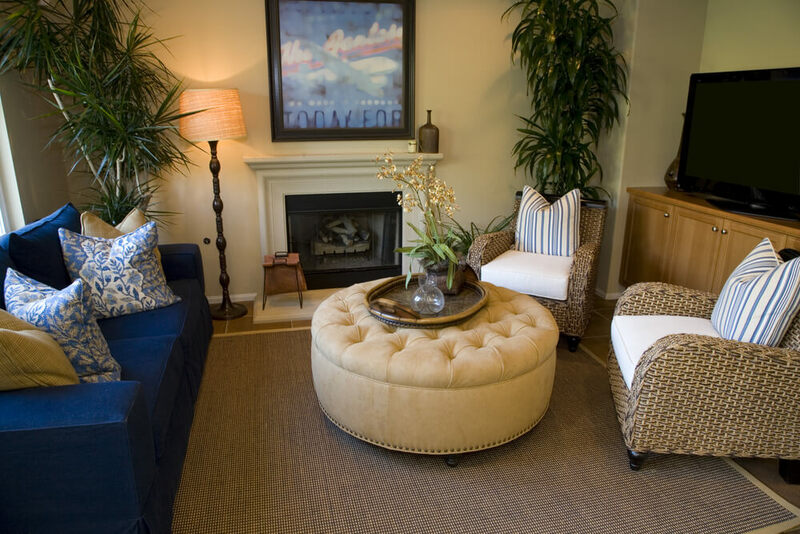 Cozy living room centers round button tufted and nail head trimmed ottoman between twin wicker armchairs and navy blue sofa. 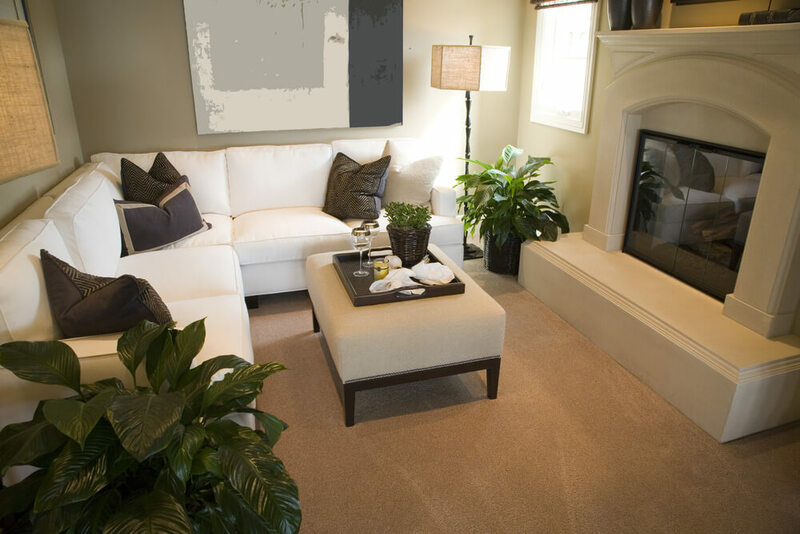 Light beige tones dominate this living room, featuring matching couch and chair set around rectangular patterned fabric ottoman with white removable table surface. .
Black wood frame with white tufted leather bench ottoman, seated next to large black wood coffee table, center this white and tan living room with matching couches and natural hardwood flooring. Ultra modern high ceiling living space here includes minimalist light wood paneling around marble fireplace, with large black leather ottoman at center, featuring removable fabric cushion top and portable tray table in black. 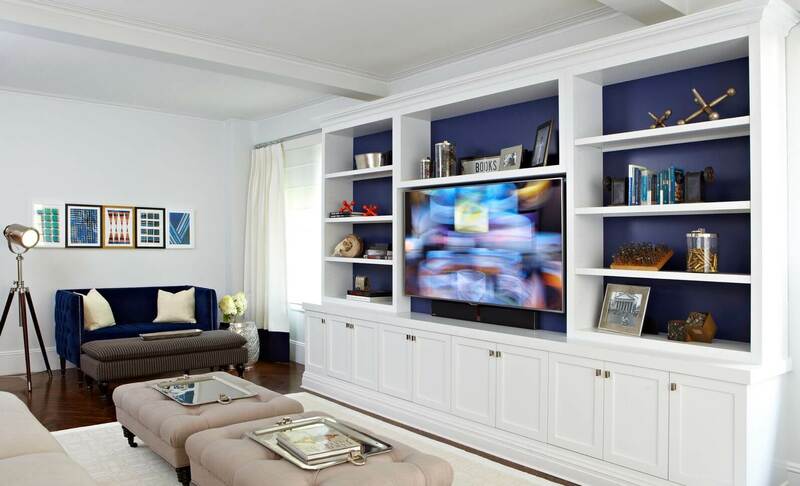 Bright white walls and cabinetry contrast with dark natural wood flooring in this living room featuring dual button tufted square ottomans with castered feet. . Compact, elegant living room awash in rich textures, including red tufted leather and dark wood ottoman at center, on striped rug over natural hardwood flooring. 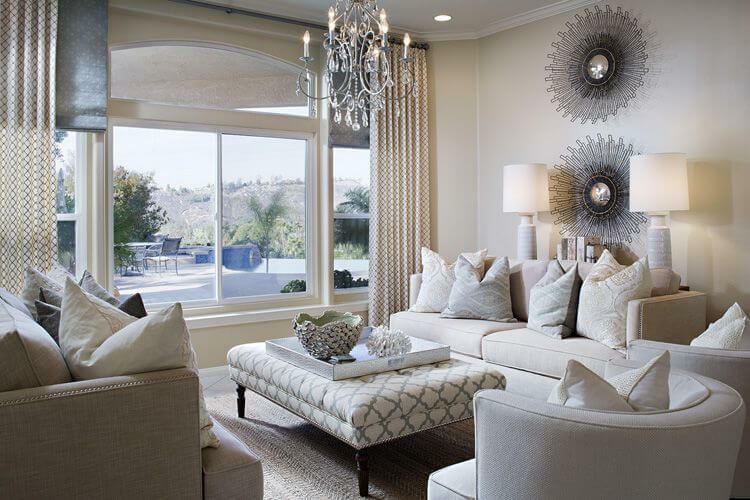 Light natural tones in this living room contrast with chrome legged, brown fabric sectional couch with matching ottoman, featuring reversible cushion tops and inner storage. . 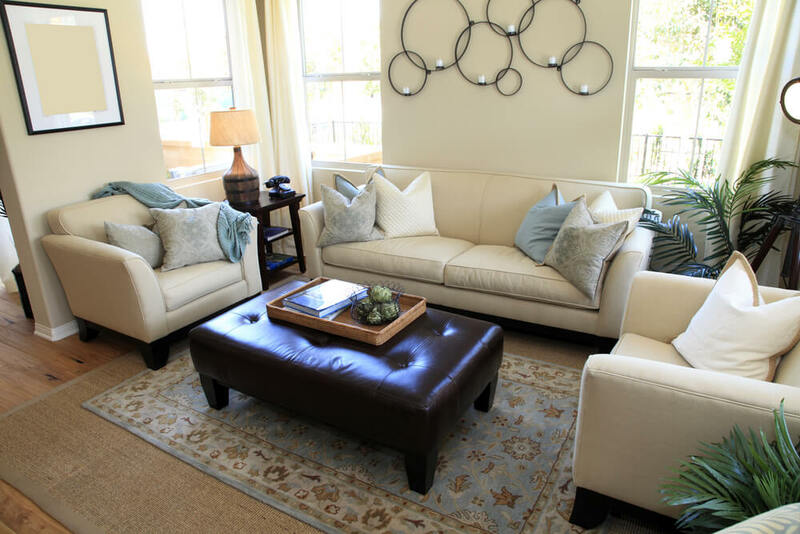 Cozy white living room with natural hardwood flooring and linen upholstered seating is centered around large bench style button tufted brown ottoman. 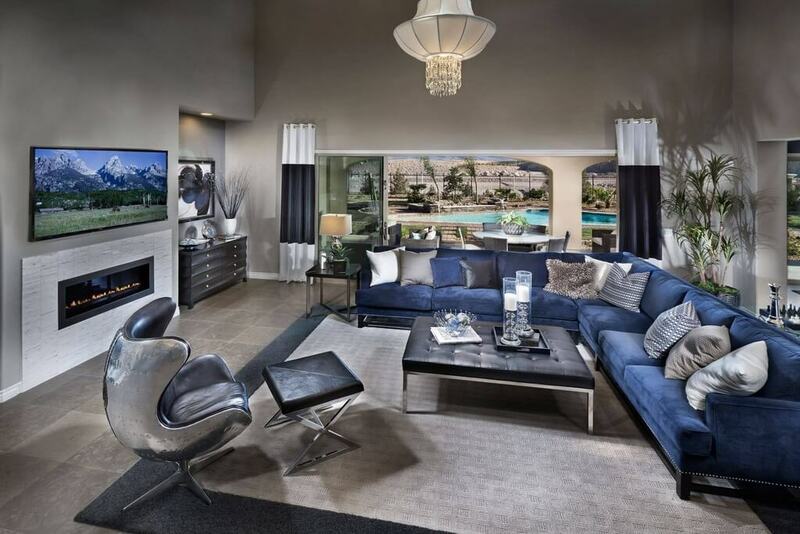 Luxurious living room awash in multiple exotic textures, featuring marble topped bar table, leather easy chairs, overstuffed orange sofa and large tufted bench ottoman next to hardwood coffee table. 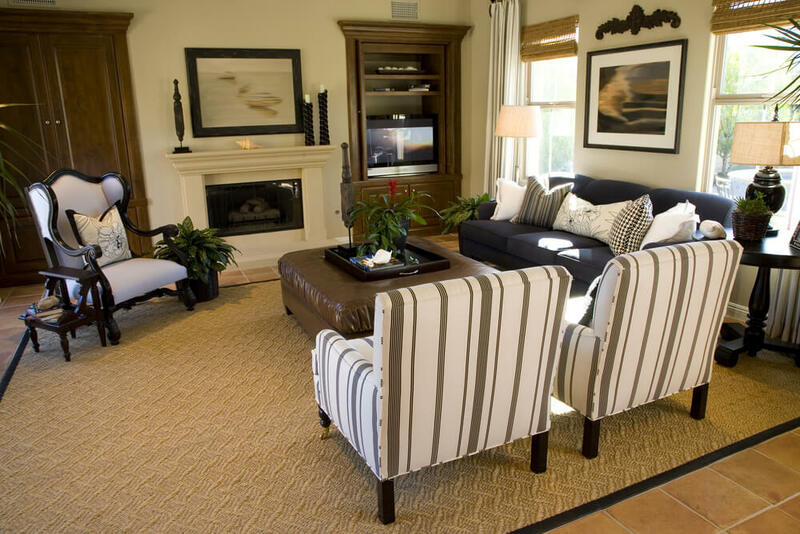 High contrast black and white living room features mixture of furniture styles, including zebra print twin square ottomans with hardwood base at center. . 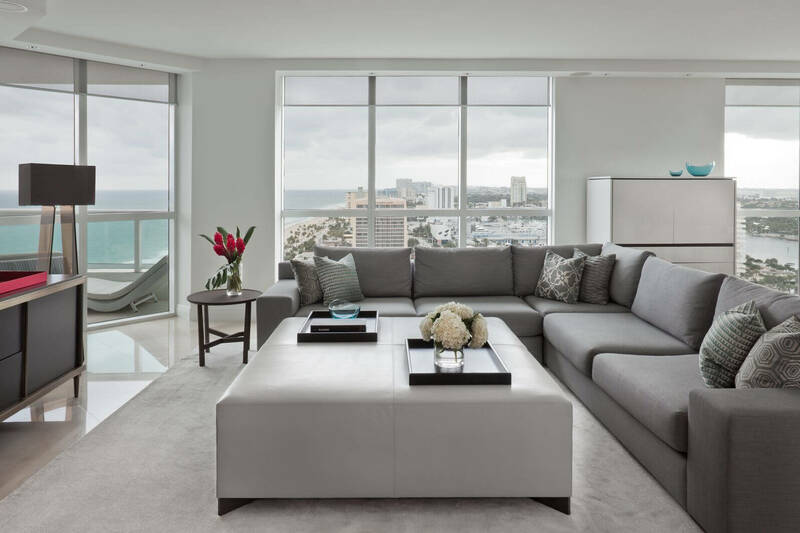 Unique low profile square white tufted ottoman centers this living room with full mirrored table top surface over dark rug on white marble flooring. Lush red L-shaped sectional sofa wraps around this plush brown oval ottoman in fabric upholstery, with removable tray table on cushion surface. .
Ultra modern living room features dark brown and white contrast, with brown patterned tufted leather ottoman in foreground and purple cushion top fabric upholstered ottoman on far white wall. 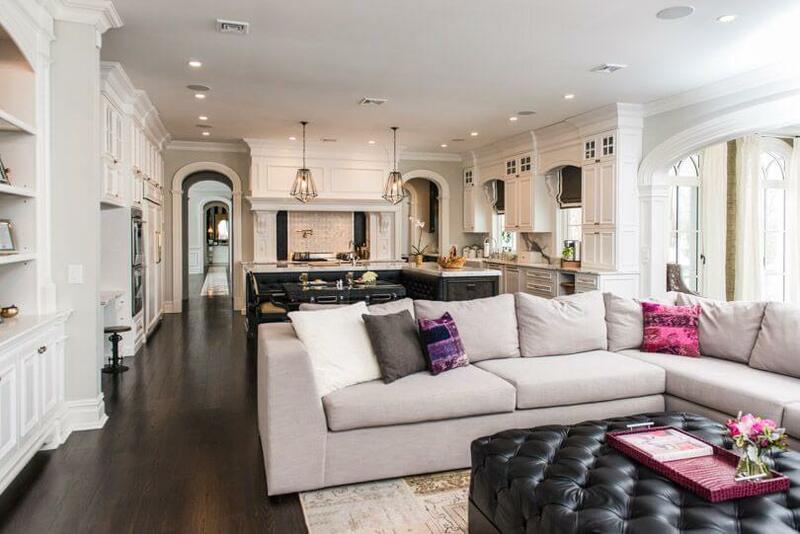 Ornate, open white space shares kitchen and living room, featuring L-shaped sectional grey couch on patterned rug, centered around large square button tufted leather ottoman. .
Immense vaulted ceiling room features both matching cushion- and wood-topped ottomans, extending the seating space of the sectional sofa and providing surface for drinks and entertainment. Don’t forget to check out our favorite video gallery!